The majority of our plum offerings are Japanese varieties, which include many different colors, shapes and flavors. The most familiar and popular is Santa Rosa with its tart purple skin and sweet, juicy, amber flesh. The tree is usually very productive and, if the plums are picked when still firm, they are more useful for cooking and baking. When soft ripe, it is best to eat them out of hand. 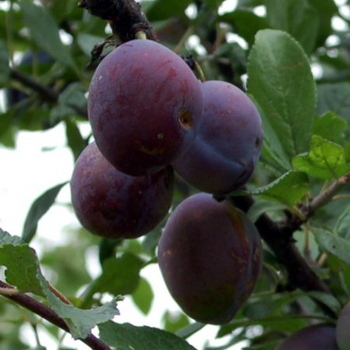 Plum trees are usually vigorous growers and they have few diseases in our area, considered to be the dry West. If fungal diseases and insects such as scale occur in your area, a spray of copper sulfate combined with horticultural oil should be applied during the dormant season. When plum leaves start to curl, many people suspect that their trees have been infected with peach leaf curl, the fungal disease of peaches and nectarines. However, curled plum leaves generally indicate the presence of aphids. This problem can be handled with a spray of insecticidal soap, or, if available in your area, a package of live lady bugs. Because the Japanese plums are so vigorous, strong pruning is recommended. You can prune in the dormant season and again in the summer months. These trees are often pruned into a vase shape. For the first ten years, the long, whip-like branches should be trimmed to 2/3 to of their length. After that, most of the new growth should be removed, only replacing very old limbs with new ones. It is also important to thin the fruit when it is very young to insure larger fruit and also to prevent the limbs from breaking under too heavy a load. European plum trees are usually trained with a central leader since they do not branch as freely as the Japanese trees and will thus need less overall pruning. Two popular old European varieties (which we invariably sell out of early in the season) are Blue Damson and Bavay's Green Gage. Blue Damson is most widely used for jams and jellies. It is late blooming and hardier than most of the other plums - hardy to Zone 5. The other European varieties we sell are French Prune, Italian Prune, Stanley and Sugar Prune. These plums are also more cold hardy than the Japanese varieties and they have a much higher sugar content which make them excellent for drying. The Santa Rosa plum has the advantage of being an excellent pollenizer for other plums and Pluots. It grows in many diverse climates due to its low chilling requirements. A close relative of the Santa Rosa is the Weeping Santa Rosa. This is a wonderful landscape tree with the added bonus of flavorful fruit that is similar to its relative, but ripens approximately two weeks later. Japanese plums with dark flesh and no tartness in the skin include Satsuma, Burgundy and Mariposa. For something unique, there is Emerald Beaut, a green skinned plum with great flavor that can remain on the tree through early October. Plums make wonderful desserts, but they have other delightful uses as well. The following is a recipe for a Chinese sauce that is excellent served with chicken, turkey or pork. Heat the oil in a saucepan and cook the onion till soft. Mix the cornstarch with the vinegar and sugar and add to the onions. Cook till thickened, then add the salt, plums and ginger. Cook until the fruit is tender. This sauce will last a long time in the refrigerator and even longer in the freezer. Since only a small amount is needed, you might wish to halve the recipe. Standard rootstock for apricots, plums, prunes, most almonds. Mature trees comparatively small, 15-20 ft. if unpruned; can be kept smaller with summer pruning. Shallow root system, much more tolerant of wet soils than Lovell or Nemaguard. Not tolerant of hot soils. Has tendency to sucker. Resistant to oak root fungus, root knot nematodes, root rot. Four of the following five varieties grafted onto one tree: Beauty, Burgundy, Golden Nectar, Methley, Santa Rosa. Available on Cit. Sweet, flavorful plum, more widely adapted than Santa Rosa and more productive in cool, rainy climates. Fruit has red over yellow skin, amber flesh is streaked red. Good pollenizer. Ripens in June. 250 hrs. Self-fruitful. Available on Myro. Sweet, flavorful plum, more widely adapted than Santa Rosa and more productive in cool, rainy climates. Fruit has red over yellow skin, amber flesh is streaked red. Good pollenizer. Ripens in June. 250 hrs. Self-fruitful. Available on Cit. Very old variety, rugged, vigorous and dependable. Small, round, blue-black plums for jams and jellies. Freestone flesh is green and tart. Late blooming, cold hardy to zone 5, heavy bearing. Ripens in late August/early September. 800 hours. Self-fruitful. Available on Mari. Sweet, juicy and pleasing mild flavored plum with maroon skin and flesh, small pit and little or no tartness. High taste test scores. Very productive. Tree has narrow, upright habit. Prolonged harvest, late July to mid August. 300 hrs. Self-fruitful. Available on Myro. 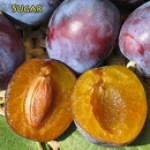 Sweet, juicy and pleasing mild flavored plum with maroon skin and flesh, small pit and little or no tartness. High taste test scores. Very productive. Tree has narrow, upright habit. Prolonged harvest, late July to mid August. 300 hrs. Self-fruitful. Available on Cit. Large, black skinned, favorite fresh market plum with very high taste test scores; one of the best plums for fresh eating. Amber flesh is sweet and juicy but still firm when fully ripe, with very little tartness at skin and pit. Ripens late July. Vigorous, productive tree; one of the best choices for home planting. 3-400 hrs. Self-fruitful. Available on Cit. Home orchard favorite! Large, heart shaped plum with sweet, juicy, firm red flesh, rich flavor and dark reddish purple, mottled skin. Hardy, heavy bearing. Ripens in September with long harvest season. 500 hours or less. Pollenized by Beauty or Santa Rosa. Available on Myro. Home orchard favorite! Large, heart shaped plum with sweet, juicy, firm red flesh, rich flavor and dark reddish purple, mottled skin. Hardy, heavy bearing. Ripens in September with long harvest season. 500 hours or less. Pollenized by Beauty or Santa Rosa. Available on Cit. Very high taste test scorer. Has light green skin and greenish yellow to orange freestone flesh with exceptionally sweet, distinctive, pleasing flavor. Still crunchy when ripe. Ripens late August through early October. Ripe fruit holds on tree up to two months, longer than any other stone fruit. 6-700 hours. Pollenizer required: Beauty, Late Santa Rosa, Nubiana, Burgundy, Flavor King Pluot. Pat. no. 9162 (Zaiger). Available on Myro. Very high taste test scorer. Has light green skin and greenish yellow to orange freestone flesh with exceptionally sweet, distinctive, pleasing flavor. Still crunchy when ripe. Ripens late August through early October. Ripe fruit holds on tree up to two months, longer than any other stone fruit. 6-700 hours. Pollenizer required: Beauty, Late Santa Rosa, Nubiana, Burgundy, Flavor King Pluot. Pat. no. 9162 (Zaiger). Available on Cit. 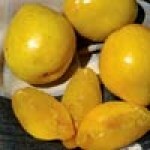 Popular, extra large, oblong yellow dessert plum. Skin is golden amber, waxy and thin, with a tender texture. Flesh is amber, firm, sweet, juicy with excellent flavor and very small pit. Ripens evenly. Great eating quality both fresh and dried and good keeping quality. Ripens in August. Partly self-fruitful or pollenize with Santa Rosa or Wickson. Pat. No. 4977. 400 hours or less. Available on Cit. Superior selection of gage-type European plums, which are later blooming and more cold hardy than Santa Rosa and other Japanese types. Bavay's is more productive in moderate winter climates than common Green Gage. Small to medium size fruit is richly flavored, very sweet. Excellent fresh and for cooking, canning. Ripens mid to late August. Relatively small tree. Originated in Belgium in the 19th century. Estimated chilling requirement is 600 hours. Self-fruitful. Available on Myro. Medium, heart shaped. Skin is golden with magenta specks and magenta blush around the stem end when ripe. Flesh is rich, dense and crisp. Unique flavor with a perfect balance of tart and sweet. Ripens early to mid August. 300 hours. Self-fruitful. Available on Mari. Medium to large plum with reddish purple skin. Red streaked amber flesh is tart-sweet, with rich flavor when fully ripe. Harvest in August, about one month after Santa Rosa. 400 hours or less. Self-fruitful. Available on Myro. Medium to large plum with reddish purple skin. Red streaked amber flesh is tart-sweet, with rich flavor when fully ripe. Harvest in August, about one month after Santa Rosa. 400 hours or less. Self-fruitful. Available on Cit. Large, red fleshed, sweet, juicy, firm, delicious plum with small pit, nearly freestone. Mottled maroon over green skin. Use fresh or cooked. Ripens in August. 250 hrs. Pollenized by Catalina, Nubiana, or Santa Rosa. Available on Myro. Large, red fleshed, sweet, juicy, firm, delicious plum with small pit, nearly freestone. Mottled maroon over green skin. Use fresh or cooked. Ripens in August. 250 hrs. Pollenized by Catalina, Nubiana, or Santa Rosa. Available on Cit. Large, sweet, firm fruit with amber flesh and dark purplish black skin. Has flattened shape with very little tartness at skin or pit. Favorite fresh market plum, excellent for home orchard. Ripens in late July/early August. 4-500 hours. Self-fruitful. Available on Myro. 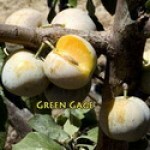 Small sour plum that is picked when fruits are small and green with dark yellow flesh. They are eaten while sour and crunchy, often seasoned with salt. 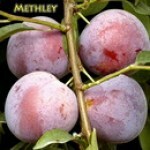 Can be left to ripen as tiny, soft, sweet juicy plums. Harvest in late April and May. 350-450 hours. Self-fruitful. Available on Myro. Most popular plum in California and Arizona. Juicy, tangy, flavorful amber flesh is tinged red. Has tart, reddish purple skin. Ripens late June. 300 hrs. Self-fruitful. Available on Myro. Most popular plum in California and Arizona. Juicy, tangy, flavorful amber flesh is tinged red. Has tart, reddish purple skin. Ripens late June. 300 hrs. Self-fruitful. Available on Cit. Second most popular plum in California. Mottled maroon over green skin with dark red, meaty flesh. Sweet, mild, not tart; favorite for jam. Ripens in late July. 300 hrs. Pollenized by Santa Rosa or Beauty. Available on Mari. Second most popular plum in California. Mottled maroon over green skin with dark red, meaty flesh. Sweet, mild, not tart; favorite for jam. Ripens in late July. 300 hrs. Pollenized by Santa Rosa or Beauty. Available on Cit. One of the most flavorful, aromatic Japanese plums when fully ripe. Beautiful eight to ten foot tree with weeping growth habit. Ripens in July, two weeks after Santa Rosa. 200-400 hrs. Self-fruitful. Available on Myro. California's commercial prune. Reddish purple skin, dark amber flesh. Very sweet, high quality fruit - dessert/can/dry. Ripens in August. 800 hrs. Self-fruitful. Available on Mari. Large, purple skinned freestone prune with rich flavor; very sweet when fully ripe. Used fresh, dried, canned. Vigorous, cold hardy tree with late bloom. Late August/early September harvest. 800 hrs. Self-fruitful. Available on Mari. Delicious large prune with dark blue skin and juicy, sweet, greenish yellow meaty flesh. Freestone. Extremely cold hardy and reliable, with late bloom. Ripens late August. 800 hrs. Self-fruitful. Available on Cit. Reddish purple skin, greenish yellow flesh, very sweet. Used fresh and for canning. Lower chilling requirement than other European prunes/plums. Ripens mid August. 550 hrs. Self-fruitful. Available on Mari.